Veridocia Team is pleased to announce the release of their second demo for Legacies of Veridocia. The fan-made RPG has been in continuous development for the past decade and is beginning to make strides in being assembled, with many building blocks in place. Just over 4 years ago, we released our first demo. We’ve made a lot of progress in overall quality, feel, and execution of the game and will use this momentum to continue adding battles, towns, and everything in between. We’re looking forward to everyone playing through the second demo and providing feedback, and hopefully joining our team. Jump into the life of Noah as he uncovers a plot to overthrow his home of Erium. Along with his friends, Noah will attempt to put an end to the plot before irreversible damage can be done, not only to his home, but to the entire land. To download the demo, please do so here for Windows. For Mac/Linux, visit here. If you have any problems running the demo, you may need to install the current version of Java. If you still run into problems after doing this, post your issues and bug reports in as much detail as you can in this thread. Don't forget to include your system information. - Arrow Keys to move. - A, S, D are equivalent to A, B, and C on a Mega Drive/Genesis controller, though A doesn't do much. S is the cancel button. D is your confirm button. In-battle Stat Sheets are viewable using D.
Veridocia Team would like to thank you for your interest and support of Legacies of Veridocia. Please enjoy the demo and let us know how you feel! This is very exciting! I will update with my impressions after I get a chance to play the demo. Hell yeah! Can't wait to play it. I played through the demo here. I apologise for the keyboard clicking, I didn't mute my OBS mic input until a few minutes in. It's an interesting demo for sure, the first thing I noticed was the amount of detail put into the title screen sprite work. Visually, the game is very impressive to look at, I love the dynamic shadows in the town. And the shop is even working to some degree. The story is just about as hamfisted as I would expect from a shining force game. I'm not looking for an overly complicated plot, and this demo does it well. Usual brooding evil, check. The prison breakout was also a fun nod to shining force 1.
captain in the second battle. It was also pretty fun to play with some high level characters and see how magic works in the game. Both fights had a good balance of difficulty versus fun factor, I always like having wiggleroom in the arena to play how I want to, without having to resort to a very specific strategy to win against absurd odds. The only other thing I'd like to see in the battles is the ability to make the cursor faster, as it seems to lag just a little bit and break up the pace of the fight. After that it opened a debug like menu. Loved them, especially the battle animations (which are absolutely gorgeous through and through). The new Darkling attack animation in particular was something I had not seen before, and was a wonderful surprise. There's certainly some places that still need help, but I don't know what's final and what still may be worked on (such as head shaking animations), so all I'm going to say is that some of the lip flaps could use some help. Visually, the maps were very good. The tile sets were competent and allowed for sufficient diversity in visuals to keep maps looking interesting and generally vibrant. 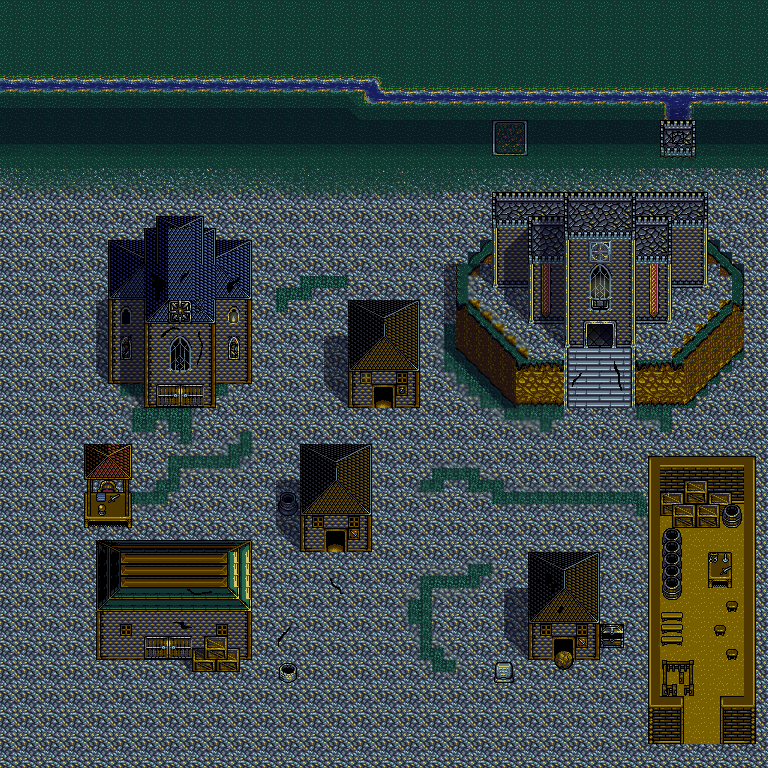 And the mappers did a good job of using the available tiles in interesting ways to make visually appealing maps. However, map navigation could be improved. Namely, the maps should be smaller. Things are really far apart in the game and I found myself wanting a run button -- something I never once felt in either SF1 or SF2. Those games were very minimalistic in the size of houses and buildings, and were careful with how the walk-ways were built so that you weren't often running around buildings. Only important buildings, like the school house, received larger floor plans. And even then, some houses (like Bowie's or Rohde's) were made into two floors instead. The castle in Legacies of Veridocia especially had large empty hallways that could be shrunk. They look good enough, certainly, but when I walk around I want things to do and see. Zoomed out or in screen shots is one thing, while playing is something else entirely. I should note that both battle scenes (the courtyard and dungeon) were appropriately sized. And I liked the large house that broke up the town in the lower right. If the other houses shrunk, I think it would make that scene all the more impactful. Besides the size of maps, my only other comment is that there is one cobblestone floor tile whose border looks unpassable. This isn't usually a problem, but sometimes it is used in places where one should walk over it. It is not so confusing that I got lost or anything, but it is something which could be improved (or at least considered in future maps or tile sets). The dialogue was surprisingly well written. At least, I was surprised. I remembered not being particularly impressed with the first demo in terms of dialogue (it was written well enough, but went on too long or didn't feel natural -- I don't quite remember what I didn't like, honestly). But this release felt really good and engaging. Cut-scenes were long enough to provide characterization, but short enough to get me to the gameplay. The NPCs also were cleverly written and generally had more world-building comments than inane "nice day" tropes. One caveat I will say to this is that while I fully explored the town, I haven't fully explored the castle yet. So hopefully the castle NPCs hold up to the same quality elsewhere. Really not much to go on yet here, but it held together well. I actually originally had plot as "general goodness" above, and it honestly could go either way. Mistral was presented as a competent villain adapting to unexpected circumstances. We have some intrigue with the unknown person to which she was talking. We have a tie-in with why the shop was out of weapons. We have a reason for why our trio checked the courtyard (no one should be there at night). We were broken out of jail by some very high powered individuals and even split the battle into two for a logical reason. So, awesome! However, one thing I couldn't get away from was that I have no idea what Mistral pinned on the trio to call them traitors. So far as we know, nothing has been done against the crown. All we have thus far is Mistral planning to do something. But nothing was done. I think she says the trio were plotting against the king (I know she say "treason," but can't remember specifically what else), but unless she's already taken over the kingdom, such a weak argument certainly wouldn't result in next-day execution, right? I dunno. It felt like a plot hole to me. Also, the whole "tripping" thing is pretty ridiculous, but in light of Bowie's soap drinking habits, that can probably be forgiven. Oh, and before I forget, Noah's really growing on me as our hero's name. Music was great. The game could use some additional scores which better fit certain scenes, but I'm sure that will happen with time and as more are written, so I can't hold that against anyone. I also appreciated the updated sound quality. I love pixel graphics for their expressiveness and flexibility (they look good "hopping" with no additional frames of animation, for example), but I'm not going to deny that the Genesis sound chip hasn't aged as gracefully. We're still early in the game, but there's already some clear characterization coming through (hopefully Huun gets a few more lines moving forward, though). And they all are distinctive graphically. From the battle side of things, they have far more diversity in stats than early game SF1 or SF2 as well (though my Noah got shafted on Attack ups, either randomly or intentionally, which made him as weak as Sharna damage-wise and ruining some diversity). Having an early archer felt really good, too. And giving Noah some early defense and HP boosts to allow him to tank for the back-liners gave a fundamental strategy back-bone that SF2 lacked with it's 3-4 person parties (SF1, of course, did not have this issue with their five person parties). All party members felt equally useful. No one was overpowered. And they all had different roles to play, but could also pinch-hit by fulfilling another role (attack, tank, heal) if necessary. Both battles felt interesting and fresh. The Darklings were generally passive, but moved in aggressively when triggered. Correct play allowed one to catch them in choke points, and the battle map did not feel either too large or too small. I honestly feel as though this battle was better in this new release than in the original, but I can't remember what exactly is different. Either way, it was interesting and provided opportunities for strategy even at this early stage. I saw a demo a long time ago of a split battle where Craig and Olivia were doing their thing while everyone else did theirs and thought it was pointless. However, Battle 2 (which was a different battle from the demo) felt really good and added some interest to the battles even at this early stage in the game. From a gameplay perspective, it could also be seen as a sort of tutorial for advanced spells too, since Craig and Olivia were by and large invincible. Battle 2 was also thematically appropriate. However, the battle balance and difficulty curves could be improved. I got through the first battle fairly easily, but I did have to think how I would do it, and there were times I hoped the Darklings wouldn't swarm or I'd be in trouble. I've always felt one of the biggest problems with SF2 was its first battle being altogether too difficult for a game introduction, and I levy the same complaint here. I could have very easily lost someone in battle (which is a bit awkward plot-wise), which really shouldn't be happening for a first fight without unabashed carelessness on my part. Moreover (just like in SF2) the second fight is far easier. There are fewer enemies to face, more 10% terrain, and my level 2 stats means that the enemy increased attack and HP are not very relevant. I think decreasing the attack of the Darklings by 1 (from 10 to 9) would go a long way in making the first battle more forgiving and making a clear up-tick in power for the soliders because the attack power difference would now be greater than the expected defense increase from level 2. I may also remove one of the Darklings from the first fight. Not sure on that yet, though. Really beautiful menu designs. I loved how individual icons bulged from the set of four when selected, the extra flourish on the spell level selection, the general graphics, even the weird glass effect on the selection cursor. I also appreciated some quality of life changes, like virtually eliminating the use of "A". There were some things I was less enthralled with, however. I realize some of these may already be listed as something to improve in the future, and some may be a matter of opinion. But I figured I'd give my opinion anyway. First, not having to press a button to see HP/MP of allies and monsters was a masterstroke. But I think the "swoosh" noise isn't necessary then. It felt weird to have a double "swoosh" when I then hit "D" and I could also see it getting a bit annoying as I scroll through an enemy grouping. When selecting which enemy to attack, not having the stats swoosh in and out, while nice in its own way, caused a loss of clarity for when the target was switched. This doesn't sound too bad if you're staring at the map, but it can be nice to stare at the stats to find the monster you thought was low on health, for example. Hopefully what I'm saying here makes sense. It would be easy to explain in a video, but not so much in text format. I prefer the magic spells to start at max level rather than the level minimum, since I suspect I'll usually be using their highest level. For the priest, Save should not be the first option. I know it's by far the most used option, but it was changed in SF2 to avoid accidental saving (which was a problem I've definitely encountered with friends), and I think that still applies here. For the shop keeper, it was weird when buying an item to have to hit "confirm" after the message came up explaining the cost, but before I said yes or no. If I didn't want to buy the item it felt especially bad since hitting "cancel" wouldn't do anything. I'm assuming this is something that you are already aware of and will be cleaned up in later releases, but just in case I figured I'd point it out here. When in battle, you always have to lift the key and press it again to get past the first dialogue of a fight. I love how if you don't press anything the battle will sit without advancing (really nice if I want to listen to the music, for example), but I do like it how just holding down a key essentially fast forwards through all the text like in SF2. Again, I hope it is clear what I'm talking about. As with plot, I could potentially place menu interface under "general goodness" rather than "needs improvement," but I think there's enough that could be improved to warrant the downgrade. I think "feels like a real game" is perhaps the biggest praise I can give right now. The demo is extremely well done, and was engaging and fun to play. Easily my biggest complaint is that there wasn't a third fight. Congrats to all who have put time and effort into this project. The dedication shows. We’ve seen a few notes regarding map size/spacing. Erium is the second largest kingdom in the game, so it’s large on purpose, which isn’t helping matters. Still, with that in mind, we’re planning on making some improvements to some areas and speed. Happy to hear about the dialogue. We’ve tried to make it a point that we don’t have a bunch of super generic dialogue. There is some there of course, but world building was big and I’m glad you noticed! NPCs in the castle should be similar, so I hope you agree! As far as Noah waking up, well, he works the night shift (as established a few times throughout, particularly when we use the night tiles), so he’ll be sleeping during the day. We tried to indicate the time of day via shadow placements as well. Music is a bit of a different beast than the rest of the game. We’ve had a few very short-lived leads on musicians compiling for us, so we’ve turned to outside help that allows us to use their tracks under Creative Commons. As you saw, we didn’t bother adhering to the standard 16-bit sound, and exactly for the reason you mentioned. In addition, those kinds of tracks aren’t in abundance! Huun does get more lines, but he won’t be as vocal as Noah or Sharna. He’s not a vocal character anyway, but he definitely stays around, and not just disappear into the background. I’m glad to hear about your battle success too. Noah was just a victim of RNG for you, but otherwise it sounds like everything went according to our plan. Battle 1 was improved by making the oozes a bit more threatening, but also by moving the bottom half up quite a bit. Previously, there was a lot of time spent picking the off one-by-one, and it made for a slow, boring battle. I’m glad you say Battle 2 as a bit of a tutorial as well, because that was something we wanted to showcase. Specifically, that magic would be a little different (Bolt 2 doesn’t behave as expected!) Circling back to the difficulty of Battle 1, I can see that, as I’ve come close to losing someone a few times when I didn’t bother getting herbs. It’s something to consider. Battle 2 definitely drops in difficulty, which is somewhat by design because Craig and Olivia serve as a distraction. Had they not been there, the heroes would be toast. Still, it does need a bit more at stake, and we’ve added to it a bit, behind the scenes. Thank you for the praise and critiques! Hi. I played this for maybe 10 minutes. It's obvious that a lot of work has gone into it; well done, team! I have two specific notes: it would be nice for noah's sword attack to follow through (I never feel like I'm making contact with an enemy) and secondly I enjoyed the large maps (this comes down to personal preference but having large maps makes it feel more epic and is more realistic (battle is a dirty dynamic business where playing perfectly isn't practical). Thank you. Hello. I came across this demo and would love to try it out as a huge SF fan. Im not the savviest on the computer front and need some help. I get this error when trying to open the .jar on my mac "An error has occurred: no lwjgl in java.library.path"
Nothing I could find on inter webs was helpful. Any guidance you can offer? Thx! Having played the last demo, I can tell that the first battle was improved at least as far as balance goes. Last time it was a tad more punishing if you didn't choose to pick off the enemies one by one. I love the town, but much like those who posted above me, I do agree that it's a little on the large side. As I understand it, Erium is supposed to be one of the larger kingdoms in the game so it does make sense for it to be that big, but when pinpointing where you're supposed to go next, you've got a lot of exploration to do lol. One thing that somewhat annoyed me as far as the battle cutscenes go is the delayed hit animation. I feel like the target should get "hit" a few frames before the end of the attacker's animation depending on the attacking character and amount of frames. My other main critique is that some of the overworld cutscene animations feel like they're missing a frame or two. Most notably when Sharna hits Huun back a few tiles as their sprites don't exactly make contact. I'm not sure if I talked to everyone or not, but from those I did talk to, I do enjoy how they hint at both events to come, and past historical events. Small things like this make the world feel more real. I remember talking to some other SF fans in the past about what makes a shining force game just that. One of the things I jokingly mentioned was "it's not a shining game if you don't end up in jail at some point." That being said, I liked that little nod to SF1 and 2. Anyways, great job so far! I cant wait to see more! Glad to see folks are mostly enjoying this thing we've been working on for what feels like forever, and of course all the visual praise has me grinning like an idiot over here. Doing my damnedest to get this game looking as good as my skill permits. @Generation - I particularly appreciate that you took the time to put it up on the youtube! @SirHedge - "feels like a real game" is real big praise. This was fun to play, thanks! Ok just finished the demo and I have to say, that was truly amazing. Not only did you get the feel of Shining games such as the 1st, 2nd, and Gaiden which truly makes this fan game feel legit, but your team added same additions such as during an attack the actual animations are a lot more fluid than previous games. I would also like to praise just the sheer amount of world you can explore within this demo, it really makes the world and characters feel a lot more developed with a bigger world, even within this small demo. I really enjoyed this and I applaud your team and everyone who's helped in the SFC who's made this project flourish. I hope this project develops even more than what's seen within this demo and good luck to you guys in the future. Thanks so much for the praise, DV. You can rest assured, work continues, and the world will open up much more in our next demo. We're doing things a little differently now though. We wanted this demo to be as perfect as possible to give the vertical slice how we wanted it. Future demos should be more regular, but may be rougher around the edges. We're hoping to release one every couple of battles or so. Story elements may be rough or missing, and art assets might be less polished or incomplete in them, but we want to show that we're moving a bit better than we did for the last 4 years between demo 1 and 2.